This is a developing web page intended to provide an overview of how data used to flow through a data processing department in the 1900 through 1990 to handle a variety of problems, such as generating pay checks, bills, bank statements, and other common situations. I will call these "traditional functions". There is no mystery to performing the "traditional functions", just plain straight forward, relatively simple logic. Oddly, the data flows follow similar paths in the above (and many other) situations. The data flow of the "traditional functions" is also shown through a stored program computer (such as a 1401 system) using serial (sorted) records. The actual data flow is substantially identical in a computer even though several "unit record" machines are replaced by the computer, . Warning, for "simplicity", some interesting, useful details are left out. For a first pass, the following is complex enough already yet! This letter discusses long card sorts. We shall call this "Current Detail Data". This data is needed each billing, payroll, ... cycle. We shall call this "Master Data". To get these finished results, you can use sequential processing (on sorted data records). By sorted I mean that say each customer has a unique customer number - this sounds heartless, but helps solve the question of how to uniquely handle three "John K. Smith" customers or employees. in unit record and also magnetic tape based data processing (such as IBM 1401 system) is remarkably similar. New data, say the electric meter reading, is processed against a master file (containing say the customer name and address and the previous meter reading and ) to print electric bills for thousands of customers. Other new data, say the records of payment, can also be processed against the same master file to print customer account information. Also the maintenance of the sorted master files. The customer may have moved locally need address change, and also handle new and dropped customers. The methods used in maintenance is similar to the methods shown in Figures 1 and 2. As is reconciliation of errors and mistakes. If you know one system above, you know the basis for all :-)). The data names change, but the techniques remain the same. This book, 17 megabytes, (offered by Stan Paddock) at least has a ( too detailed? ) data flow diagram for "Accounts Payable" in chapter 6 "Case Study", pages 82 and 83. Figure 1, Data Flow of "Traditional Functions" though Unit Record equipment. only the types of data are different. 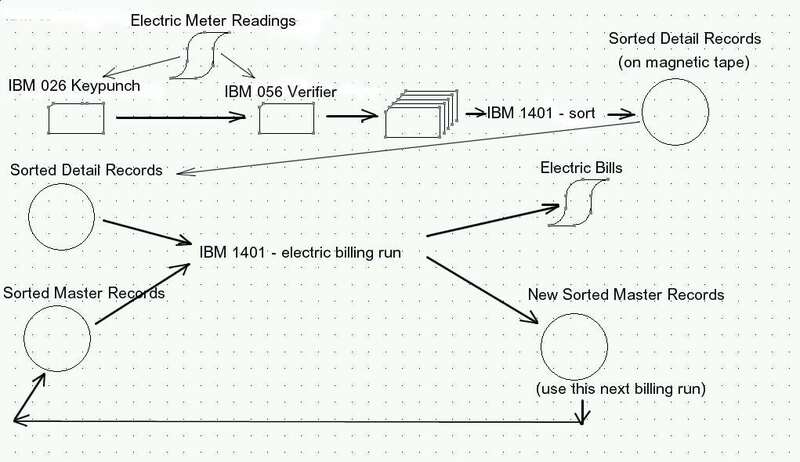 Printed Output - "Electric Bills"
with an IBM 1401 w tapes system, the data flow is remarkably similar, but the 1401 system replaces much equipment, and card handling, especially handling during sorting. Figure 2, Data Flow of "Traditional Functions" using a stored program computer with magnetic tapes. These are the "source documents" for this particular "run". - The customer's account number and street/building address and hints where to find the electric meter. - The customer number is for later use by the accounting department. The keypunch operator was always a woman - except for when I keypunched for a troubled insurance company during a college Christmas Break. The company was that desperate to get a particular "job" done. There is an account number field, a detail value field (in this case watt_hours). Each keypunch had a format card to help the operator punch into the required columns (called fields). These women were fast and accurate - at least 3 times faster than when I got paid to do it. Another "keypunch girl", sitting at an IBM 056 Verifier, reads the same document and "keypunches" the data into the same detail card as the "girl" at the IBM 026. Actually, the 056 compared the holes punched into the card with the keys being press by the 056 operator. If the holes in the card matched the key strokes by the operator, everything matched and the 056 cut a little semicircular notch in the 84th column of the card, at about the row 3 position. Since the 84th column was about 1/2 not present, the notch was on the trailing edge of the card, easily visible in a deck of cards. If there was a mis-match ??? Any card in a deck that does not have the "verification notch" was clearly visible. This procedure helped assure that two sets of eyes and hands agreed about what was on the source document. An error on the source document or the detail card usually causes customer ill will, company/government embarrassment, and expensive labor to correct. "Garbage in, garbage out" is to be avoided !!! The IBM 083 sorter (other potential sorters are 082 and 084) sort the cards by reading a single column and placing the card in the pocket identified by that column, 0 through 9, two "zone" rows ( 11 & 12, used for alphabetics and special characters), and a reject pocket for blanks or rejects or errors. There is a definite ritual to sorting in these machines. A bad joke - How was T.J. Watson buried? Face down, 9 edge in. And that is how you insert cards into most hoppers. You start sorting with the least significant digit, and in further passes sort on more significant digits. If the cards are taken from the output hoppers in the correct order and properly handled, you eventually get a deck of cards sorted from lowest customer to highest. By "Master" data we mean that data that is long term, hopefully your customers are relatively long term. This includes name, address, historical data such as previous meter reading, electric rate, special discounts, ... as well as the customer to match up with the detail information. This fascinating machine can compare the values of fields from two card decks. It can do electro-mechanical compares of two fields for greater_than, equal_to, and less_than, and make decisions, based on its plug_board wiring of what to do. If the plug_board is properly wired for this, it can merge two sorted decks together. It can place the customer master card(s) first, then the customer detail card(s), into the output deck, so that the all the customer information is together and can be processed by some machine further down the line, such as an IBM 402 accounting machine. It can also be wired so that it can detect if there is a customer detail card, but no customer master card. This situation is to be avoided !! The deck is sorted by customer number, with in this case, the master card(s) first followed by the detail card(s). The IBM 077 was programmed (by plug_board) to eliminate detail cards with no master cards. None of the previous machines, nor following machines, can multiply or divide. In our situation we need to multiply the watt_hours by the billing rate. A plug_board program can read the billing rate from a master card and multiply that by the watt_hours from a detail card, and punch the product into the same detail card. Here we are, everything ready to be processed by the accounting machine. This machine could read cards, accumulate sums, print data from cards (such as names and addresses) at up to 100 lines per minute, and print from the internal accumulators.
" Another important operation is to compare two cards to see if they have the same id (and should be counted together) or if they have different ids (so a subtotal should be printed and the counters reset)." Data processing people use the phrase "control break" for this function. The IBM 403 is similar in function and operation to the IBM 402. https://en.wikipedia.org/wiki/IBM_402 with a little handier multiline print optional control. Special preprinted forms could be used in the printer, such as for bills and pay checks. 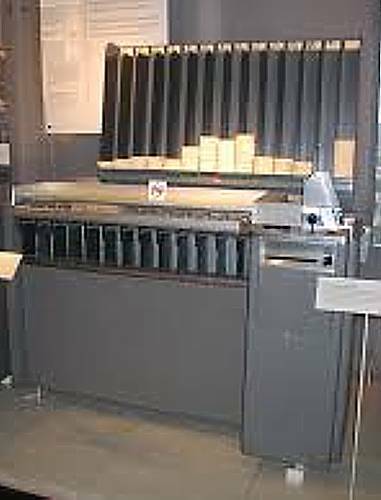 Another machine was available called a "burster" to separate the continuous forms into individual documents. Yet another machine was available to remove carbon paper for "multi-part" documents such as an "original" and two "copies". You could store these in long term storage (the mountain) say for seven years to satisfy government requirements. This can be punched (not shown) in a "Summary Punch" ( an IBM 514 will do ) under control of the IBM 402 accounting machine. These can be merged (not shown) back into the master cards. In the case of magnetic tape records, no special equipment or passes are required. The program just writes a new master tape. Sort 7 does not copy cards to tape. To do this, another program (not shown in Fig 2.) is used. This program is likely considered trivial, other than tape write error recovery. Standard I/O program, such as IOCS, can be used to handle the tape writing and error recovery. 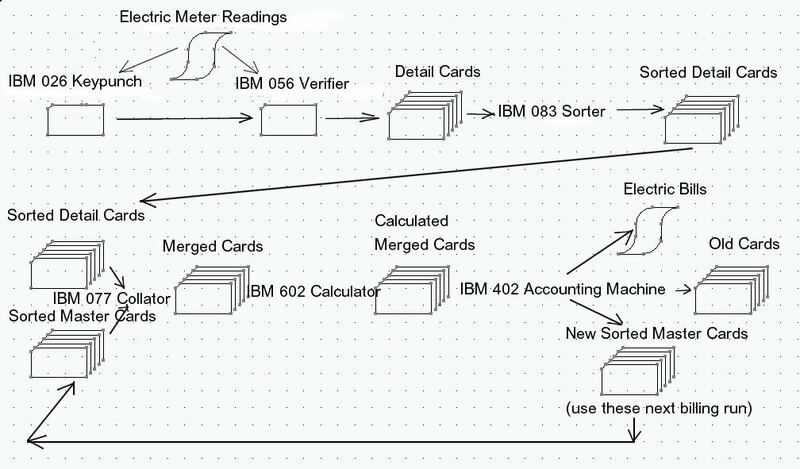 Sorting data records (cards) using a magnetic tape system is MUCH faster, and much less labor intensive compared to using the physical cards and a card sorter, such as an IBM 083. You may notice that the 1401 tape system replaces a number of (much slower) unit record devices. Since the 1401 system is so much faster than the replaced devices, multiples of each device can be replaced in medium and large size installations. Replacing the IBM 077 Collator(s), the merge operation using is almost trivially performed by the 1401 software as part of inputting Detail Data and Master Data. Exception situations (no corresponding master records) can be punched using the 1401 system's 1402 into a selected pocket. Replacing the IBM 602(s), any necessary arithmetic, adding, subtracting, multiplying, dividing, can be easily performed quickly in the 1401. If the optional multiply and divide features are not present, existing subroutines can be used. Replacing the IBM 402(s) accumulators, the 1401 easily handles any totalizing. Are you familiar with unit record data processing ?? If so, could I use you as a consultant/author ?? For all I know the traditional tasks are still done sequentially ????????? While at the 2018 Vintage Computer Festival, in CHM, Henry Strickland asked about BIG card sorts. Punched card sorting was a long, tedious, and very important part of data processing (DP). We have a sorter set up like this in Revolution which you can see next time you visit the museum. There is another that we use during the 1401 demonstrations on Wednesday afternoons and Saturday mornings. I'll be leading the 1401 demo this Wednesday at 3:00. Can you come see the demo? Now, to your question: sorter operators would leave a card on the top of the sorter threatening all sorts of unusual punishment if anyone disturbed the in process sort. When it got close to the end of a shift, the operator would try very hard to find a stopping point where the cards could be taken from the sorter and put into the extra card frame to be continued. If the operator needed a bio-break,, he would just stop the sorter and resume when he got back. Depending on the workload, an operator would hand off to the next shift operator. It would be very straight forward since the new operator would be told which card column was being sorted and just be handed the baton for the next shift. The "run book" told what to do next. It was very systematic. The key to remember is that the sorter sorts only one card column at a time -- a, then b, then c, then... a is the ones digit, b is the tens digit, c is the hundreds digit, ... It isn't difficult. The key being to not drop the cards and have to restart the sort. So, to sort by Zip-code would mean five passes of the card file. If we're doing payroll, we might have nine passes for the Social Security number. Hope this helps. Aside: Note that I said "he" as the sorter operator. A case of cards (five boxes of 2,000 cards) weighed about twenty-five pounds) Ladies weren't supposed to deal with heavy things. So they were key-punch operators and did the data entry for the DP department.